The Widmer P40 VOID Perforator is desgined for properly Voiding an Expired Driver's License - Comply with the DOT / FMCSA 49 CFR Legislation 384.211 Surrender Procedure - How to Surrender Expired Drivers License to DMV Office. 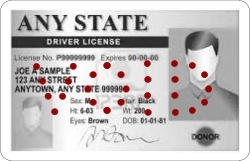 Secure method of punching holes in documents...perfect for compiance with the DOT / FMCSA Legilation for properly handling and processing driver's licenses at the DMV office. Just Insert the Drivers License to be voided, pull the lever to perforate. Easily peforates the word VOID through plastic coated diver's licenses ad ID Cards, found in the U.S.A.
How To video on the Widmer Kon P400 Drivers License VOID Perforator.